An Italian term for a food spread, typically made with Italian black olives that are pureed and mixed with olive oil and black pepper. This spread is generally served on fresh bread, but also is served on crackers and toasted breads. 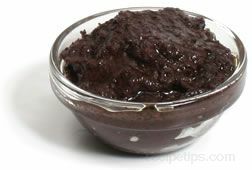 There are a variety of olive spreads produced that use some form of the Italian version to create this condiment. An Olivada is also referred to as an Olive Spread or Olive Paste. The Olive Paste made with green olives is referred to as Oliverde.